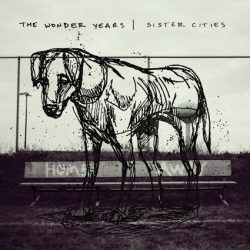 The Wonder Years release their new album Sister Cities on 6th April via Hopeless Records. Recorded at Sunset Sound with Joe Chiccarelli (Manchester Orchestra, The Shins, Spoon) and Carlos de la Garza (Jimmy Eat World, Paramore), Sister Cities is an album about distance, connectivity and the way humanity towers above boundaries. They’ve gone from being pop punk (on 2010s The Upsides) to emo tinged pop punk on Suburbia I’ve Given You Everything… (2011) to triumphant emotional punk rock on 2013s Greatest Generation to more adult orientated punk rock on No Closer To Heaven (2015). Sister Cities continues the development with it coming over as their strongest, most confident album to date. You can’t help but love this album, as soon as ‘Raining In Kyoto’ kicks off it’s like you’re being reunited with a friend, tears will be shed and good times are afoot. ‘Pyramids of Salt’ is a grower, if you aren’t sure at first give it a couple more goes and it will surely become one of your favourites. Both ‘It Must Get Lonely’ and ‘Flowers Where Your Face Should Be’ are a little dark but there’s a positivity under the covers – depending on how you relate to them.